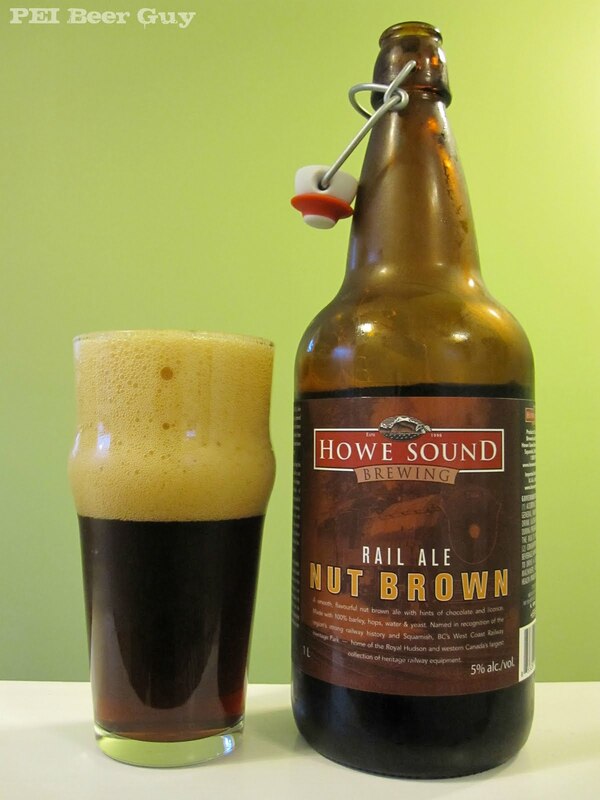 This, my fourth beer from the Howe Sound Brewing Company pours a clear and fairly dark brown that is brighter and lighter on the edges. It has lots of head, which only lasts a couple of minutes. It leaves a somewhat pop-like skim of bubbles on top. At first, it does have a bit of black licorice in the smell, even more than the advertised notes of dark chocolate (which do come out a bit more as it warms). The aroma's stronger notes are of molasses and rye bread. The beginning of each sip has a smooth chocolate flavour - then transforms into full-on rye bread territory. It's like the liquefied version of a heavy, hearty bread overall - without being heavy, if that makes sense. I only pick up a relatively minor amount of non-specific nuttiness. The feel of it is quite light, and it has a rather sweet and clean finish. It's somewhat refreshing and goes down easy - it'd be no problem to put away a good little amount of this in one sitting. The carbonation is bright, but subtle. It tickles the tongue just enough before it evaporates towards the roof of your mouth. Overall - a nice, easy-drinking, pretty-tasty, lighter-than-expected, refreshing brown ale. Not extremely memorable, but a quality beer nonetheless. This stuff is on tap at the University of Victoria grad lounge along with the King Heffy imperial hef. Both are absolutely lovely on tap. I've been a Heffy addict in the bottle, but the nut brown for some reason is not as stunning in bottle as at school. Unless you've covered Heffy (not had time to read much blogs, just had a new child) I recommend you get some mate.